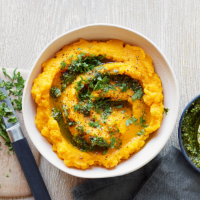 This brightly coloured mash makes a delicious alternative to potato mash and a perfect accompaniment to meat and fish at any time of the year. Preheat the oven to 200°C, gas mark 6. Cut the garlic bulb in half horizontally, place on a large sheet of foil, drizzle with 1 tablespoon of the oil and season with sea salt and pepper. Wrap the foil around the garlic and place on a baking sheet in the oven for 40 minutes, until golden and soft. Place the carrots and swede in a large pan of water and bring to the boil. Simmer for 20 minutes until soft, then drain and allow to cool in the colander for 5 minutes. Return the carrots and swede to a clean saucepan. Squeeze in the roasted garlic, throwing away the papery skins, and add the butter, then purée using a stick blender. Place the parsley, walnuts, lemon juice and remaining oil into a mini processor and whizz until smooth. Spoon the mash into a serving bowl, swirl with the pesto and serve. Scatter over some extra chopped parsley, if you wish.